Amazigh Morocco offers you through his travels and tours of the Sahara Desert opportunity to meet this mythical place of an authentic and profound form of the hand of our native guides. They are designed to travel all travelers including 4×4 routes and dromedary. Go through us dunes and oasis in Zagora, Mhamid, Merzouga. We are the perfect alternative for a traveler reported that he knows what he wants. Enjoy this incredible journey into the desert from Marrakech, a single route that takes you from the Atlas mountains, plains and through the desert oasis until Merzouga. This tour of the Desert Zagora is a feast for the senses. Film kasbahs discover the beauty of the largest valley in Morocco, precious and semi-arid plains numerous Berber villages. In this tour through the desert of Zagora you will see amazing cities, the most striking landscapes, wonderful kasbah, the grandeur of the Draa Valley and the starry sky from dusk haimas. With this tour through the desert of Erg Lihoudi you will lower from the stunning Atlas mountains to the desert of Erg Chegaga, through wonderful oasis and villages as Agdz. Learn the secrets of cultivation of saffron in a vast and majestic valley is a unique experience that will captivate the traveler in this 5 day tour by the tranquility of the desert and Saffron Valley. Enjoy this getaway a luxury available to everyone for emocionaros with Morocco. 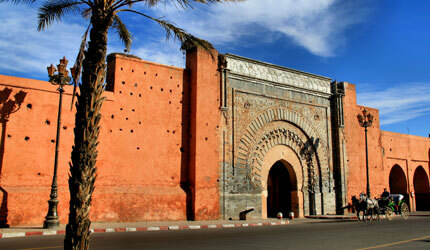 The imperial city of Marrakech and the desert of Agafay dazzle you with their colors and charm.